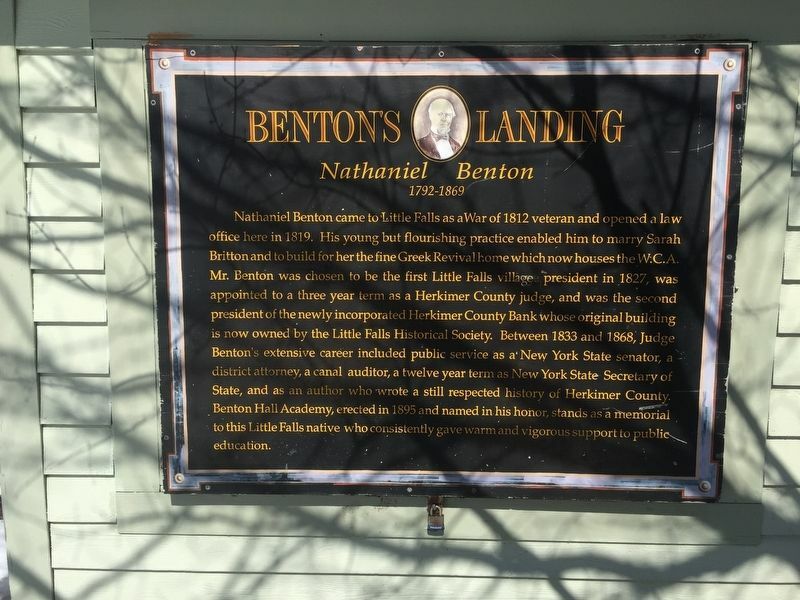 Nathaniel Benton came to Little Falls as a War of 1812 veteran and opened a law office here in 1819. His young but flourishing practice enabled him to marry Sarah Britton and to build for her the fine Greek Revival home which now houses the W.C.A. Mr. Benton was chosen to be the first Little Falls village president in 1827, was appointed to a three year term as a Herkimer County judge, and was the second president of the newly incorporated Herkimer County Bank whose original building is now owned by the Little Falls Historical Society. Between 1833 and 1868, Judge Benton's extensive career included public service as a New York State senator, a district attorney, a canal auditor, a twelve year term as New York State Secretary of State, and as an author who wrote a still respected history of Herkimer County. Benton Hall Academy, erected in 1895 and named in his honor, stands as a memorial to this Little Falls native who consistently gave warm and vigorous support to public education. Herkimer County. Marker can be reached from Seeley Street near Mohawk. Touch for map. 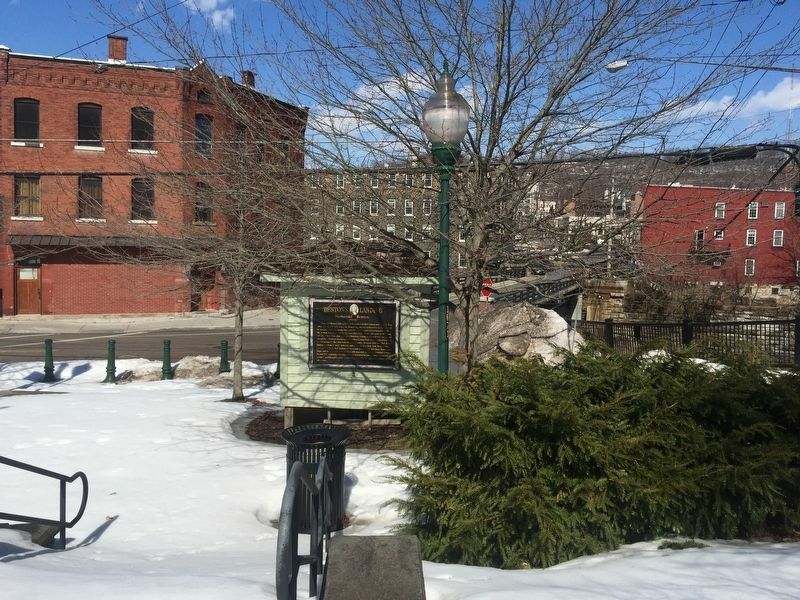 Marker is in this post office area: Little Falls NY 13365, United States of America. Touch for directions. Other nearby markers. At least 8 other markers are within walking distance of this marker. Little Falls (a few steps from this marker); A Bridge for Boats (a few steps from this marker); Route of the Little Falls Canal (about 500 feet away, measured in a direct line); The Cheese Business (approx. 0.2 miles away); The World's Best Cheddar (approx. 0.2 miles away); The Street Cheese Market (approx. ¼ mile away); Shaping the City (approx. ¼ mile away); Window on the Past (approx. ¼ mile away). Touch for a list and map of all markers in Little Falls. More. Search the internet for Benton’s Landing.